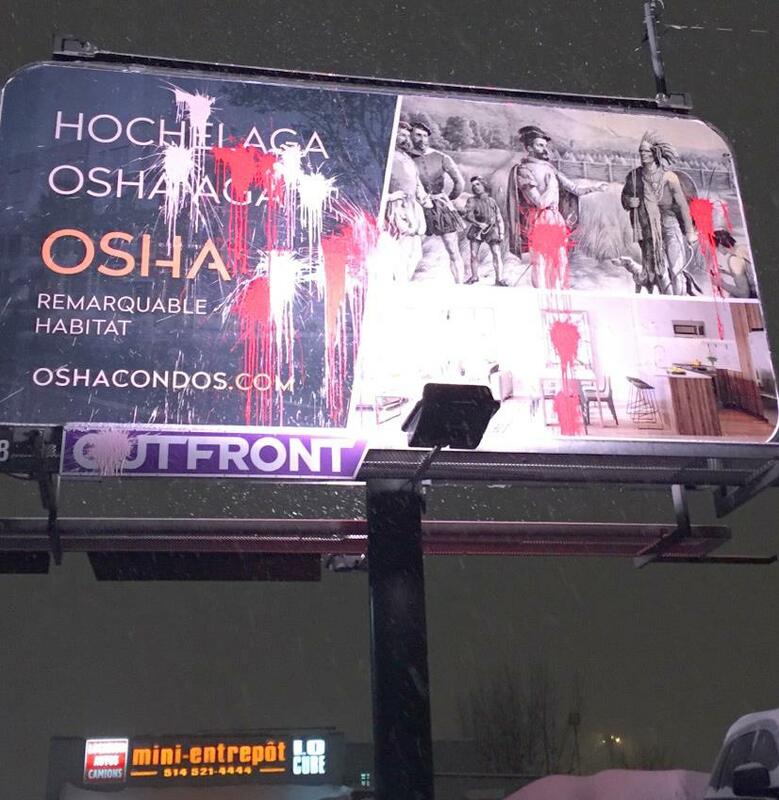 Last night and the one before, different crews bombarded the colonial-themed advertising billboards for the new condo project OSHA with paint. The OSHA Condo project is simple: the destruction of Hochelaga. How? With the arrival of more than 200 condo units (selling for between $200 000 for a 2 and a half and more than $500 000 for a 4 and a half). Meaning 300 to 500 more yuppies in our neighborhood, and in a particularly sensitive location home to many of those tossed aside in recent decades by different real estate developments. The arrival of opulence, where misery reigns. Raising the number of cops and patrols, of expensive eco-ethico-responsible-biodegradable stores, of chic restaurants daring to name themselves “Les AffamÉes” (“the starving”) in one of the largest food deserts in Montreal. A social cleansing in every respect. Adding insult to injury, the owners decided to use an indigenous theme. The billboards’ use of an image of the encounter between peoples reinforces the idea of a peaceful and consensual exchange between colonizers and first peoples. We shatter this image. The Americas were built in violence. Montreal is a city made possible by a genocide. Its modernization rests since its foundation on the exploitation of stolen land. The OSHA condo project is only the latest, most pathetic example. And you thought we would let you do as you like? The plurality of groups currently organizing against the construction of these condos testifies to the feeling of anger, widely shared in the neighborhood, against this latest offensive of gentrification. In the months to come, the forms of contestation and sabotage will multiply. Despite the advances of gentrifying projects in Hochelaga, an expertise of struggle against them has developed, and there is no doubt we will put it to use.